Bristol City winger Ivan Sproule says he is looking forward to playing in the Championship after completing his move from Hibernian. The Northern Ireland international, who helped Hibs win the CIS Cup last season, moves for an undisclosed fee believed to be about £500,000. "This is a big step up for me and I need to build myself a new reputation," the 26-year-old told the club website. Sproule has signed a three-year contract at Ashton Gate. Last year, Sproule turned down a move to Ukranian club Dnipro, but said he was ready for a new challenge. "It is a good league up in Scotland but it is an even stronger one, in my opinion, down here," said Sproule. "There are some good players at this club already and I am going to have to work hard and fight for my place. "I have nothing but good words for Hibs as a club - and all the players, staff and supporters - they were great to me." Sproule said he believed he would become a better player under City manager Gary Johnson. "Gary was a big factor and as a club they made it clear they were determined to get me," said Sproule. "It is an exciting time for Bristol City, they are a club on the up which is good for me and my international ambitions." 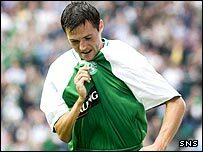 Sproule made 94 appearances, scoring 18 goals, since joining Hibs from Institute in 2005.